Dr. Khalili-Araghi specializes in theoretical and computational studies of ion channels. She obtained her B.S. in Physics from Sharif University of Technology in 2001, and her PhD from University of Illinois at Urbana-Champaign in 2010. 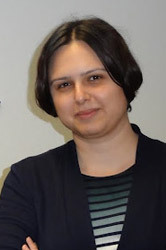 She has been a postdoctoral scholar at the University of Chicago from 2010 to 2013, where she has continued studies of membrane proteins with a focus on the NaK ATPase using computational modeling techniques, as well as molecular dynamics simulations. Her research at UIC will continue on theoretical and computational studies of membrane proteins. An emerging consensus on voltage-dependent gating from computational modeling and molecular dynamics simulations. Journal of General Physiology, 140:587-594, 2012. Molecular dynamics investigation of the w-current in the Kv1.2 voltage sensor domains. Biophysical Journal, 102:258-267, 2012. Constant electric field simulations of the membrane potential illustrated with simple systems. Biochimica et Biophysica Acta (BBA) - Biomembranes, 1818:294-302, 2012. Calculation of the gating charge for the Kv1.2 voltage-activated potassium channel. Biophysical Journal, 98:2189-2198, 2010. Free energy calculation from steered molecular dynamics simulations using Jarzynski's equality. Journal of Chemical Physics, 119:3559-3566, 2003.